Also known as a scarless facelift or mid face suspension, the results of this procedure are unmatched and patients are left with no visible scarring. This is not a pulling procedure, this is a true lifting procedure. Mid face rejuvenation is ideal for those who are having signs of aging around the eye and cheek area as this procedure reduces the distance between the lower eyelid and the top of the cheek, re-directs the tear trough from a diagonal to a more youthful horizontal direction. It also reduces prominent nasal labial folds (1). The brow line can be lifted in the same manner to further contribute to a more youthful appearance. Instead of pulling the face as in a traditional facelift, the mid face suspension uses volumetric augmentation, meaning the cheeks are lifted not stretched, to achieve a fresher appearance (2). 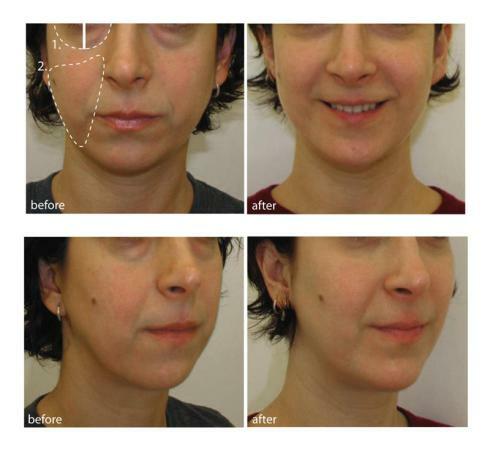 This is a convenient and less drastic alternative to a traditional facelift. The reason for no visible scarring is the small incisions are made inside the mouth and above the hairline. The endoscopic approach is significantly less invasive which results in a shorter recovery period and involves fewer risks. This procedure does not remove loose skin, but can be combined with a neck lift or eye lift, tailored to each patient’s needs. If you feel as though your face is looking tired or your skin is beginning to sag but you’re not ready to go under the knife, the mid facelift may be just what you need. Typical candidates are in their 20′s to 50’s who feel as though their cheeks have dropped and begun to flatten. The results are subtler than a traditional facelift so it is important to be informed on how the procedure can and cannot correct various cosmetic problems.